With the capacity to produce vast quantities of de-icing salt annually, American Rock Salt helps ensure safe winter road conditions for millions of people in 12 states. Each day, depending on demand, between 10,000 and 18,000 tons are produced by our experienced miners, which makes American Rock Salt the largest producing salt mine in the USA. We also have the largest distribution network in the northeast, which means more dependable (and faster) delivery. Our highest priority is pleasing the customers who use our products. 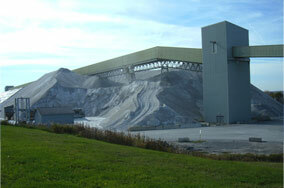 Unlike competitors, all of the rock salt we sell comes from the United States – from our Hampton Corners mine south of Rochester, New York. We draw on the experience of several generations of American rock salt miners. As they mentor and train our newest employees, we benefit from the blend of youth and experience. American Rock Salt has revitalized the economy of this entire region, bringing over 200 new jobs to Livingston County and hundreds of related jobs to the region through the trucking, rail, and construction industries. 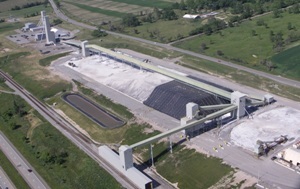 Founded in January 1997 by Joseph Bucci, Gunther Buerman, and Neil Cohen, American Rock Salt is the first successful salt mine to be built in the United States since 1960. To ensure American Rock Salt is environmentally friendly, we work closely with the New York State Department of Environmental Conservation. Our mine, with its underground screening and crushing operations, prevents dust and particles from reaching the surface. In addition, our quality control engineer monitors groundwater and river water daily to ensure all ecosystems remain in balance. Customers benefit from the speed, efficiency, and automation of our operation. Truck and rail transport are available, as well as an automated loadout system. The result? Even during the busiest season, trucks are on site for no more than a half hour and loaded in under a minute -- less than half the time of other companies.